The pledge was written by a socialist! Francis Bellamy was a Christian Socialist. As a Baptist minister, Francis got into trouble by trying to insert « social justice » into Christianity. The parish effectively fired him by cutting his salary drastically so that he had to find a different job. The pledge was an ad campaign to sell magazines in 1892! Whatever else the « Pledge » has accomplished since then, the flag campaign that made it famous coincided with a huge increase in The Youth’s Companion’s circulation, something like a 50% increase, from about 4000,000, that is, to over 600,000. The pledge was designed as the beginning of a civil religion, bringing the strength of religious belief into « patriotism ». Most obvious was the need to acculturate, or « naturalize » as the odd term has it, a teeming influx of immigrants. Their usefulness as immigrant « operatives » who worked in America’s factories did little to ally the uneasiness of nativist sentiment. It was felt that these great unwashed, especially the more swarthy Eastern and Southern European ones, who « inherit no love for our country, » as Margaret Miller puts it in her history of the « Pledge, » had to be imbued with a « thoroughly American feeling » . Many people have been distressed by post-9/11 advertising that confuses patriotism with consumerism. But using the flag to sell things is an old tradition — older than desecration laws that were enacted to criminalize this sort of behavior at the beginning of the last century. Recently, I came across an earlier, noteworthy conflation of patriotic symbolism with greed. 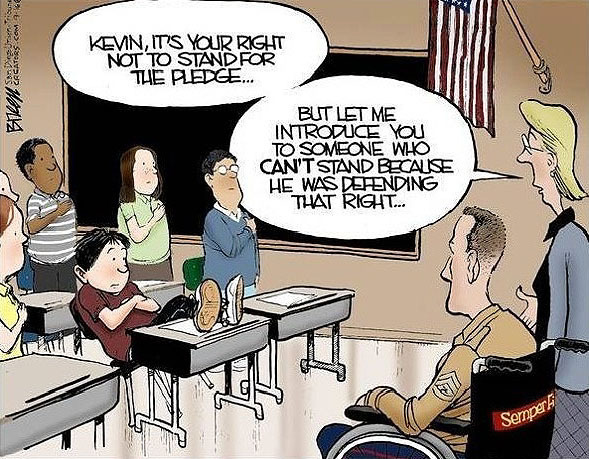 In this case it concerned The Pledge of Allegiance. I learned about this confusion inadvertently researching the life of my great-grandfather, Edward Bellamy, the author of Looking Backward. Edward’s first cousin, Francis Bellamy, briefly became a socialist after reading this celebrated political novel. Francis also wrote the Pledge of Allegiance. Francis’s stint as a Christian Socialist was enthusiastic, if brief. So too was his tenure as a Baptist Minister. Exploring his life, I was hardly on the lookout for the now only-too-familiar tendency to conflate capitalism with Americanism. Though he did deliver his « Jesus was a Socialist » talk shortly before he wrote the Pledge, Francis played a role in this confusion. It may well be that his turn from socialism to reactionary politics was a reaction to his congregation’s resistance to his left-wing ideas. He preached to them relentlessly about Christian obligations to the poor. They grew weary and fired him. He then quit the ministry altogether. Francis Bellamy wrote the Pledge the next year. It was the byproduct of a scheme to sell flags to public schools hatched by Francis’s employer. The Youth’s Companion was the best-selling American magazine of the time. The idea was to synchronize simultaneous flag-raisings over the nation’s schoolhouses on Columbus Day in 1892 (the four hundredth anniversary of the discovery of the New World). These celebrations were to coincide with the opening of the Chicago World’s Fair. For the occasion, the magazine published an elaborate ceremony, written mostly by Bellamy, which included the Pledge. Over 26,000 flags were sold at cost — or so said The Youth’s Companion. The surrounding campaign certainly enhanced the magazine’s considerable prestige and helped boost its circulation by 50 percent. A variety of pseudo-events were orchestrated by Bellamy, the project manager. These included a Presidential Proclamation, interviews with Congressmen, and boiler-plate editorials distributed to newspapers across the nation. The Pledge attained its canonical status through this media blitz. Nothing of its scope had ever occurred before. After its appearance, the Pledge has been surrounded by issues of ownership. Years after he wrote it, Francis discovered — thanks to hearing a quiz show on the radio — that the Companion attributed authorship of the Pledge to Bellamy’s deceased boss, unlike Bellamy, a long-time company man at the magazine. Years of depositions, recriminations, and character assassinations ensued. Congress itself finally vindicated Francis, although this didn’t prevent the later publication of a book-length polemic challenging his authorship. In the meantime, Francis’s politics kept drifting rightward, much like the conservative uses to which the Pledge has since been put. In the xenophobic 1920s he devised « A Plan for a Counterattack on the Nation’s Internal Foes: How to Mobilize the Masses to Support Primary American Doctrines. » This proposal aimed to harness the Pledge to a campaign against « traitors. » For Francis, « traitors » included immigrants, Wobblies, and union members. The proposal was never published (though the desire to use the Pledge to purge has endured). As I followed Francis Bellamy’s rightward drift, it occurred to me that his eventual identification of Americanism with capitalism was already implicit in the flag-and-pledge campaign. The Companion sent students across the country 100 « free shares » in « the influence of the flag. » They, in turn, were to raise money to buy their school flags by selling these shares to classmates at 10 cents a share. Though the official theme of the Colombus Day extravaganza was the Enlightenment — manifested, in the inadvertent discovery of the New World and by the establishment of America’s « free » (tax-supported) schools — the flag-and-pledge caper actually equated citizenship with capitalism, and stake-holding with holding stock. Old Glory wasn’t a sacred symbol of the nation’s indivisible unity, but a commodifiable object like any other. In short, commercialized patriotism has been with us for some time, shock sensibilities about the recent unseemly commercialism notwithstanding. Let me know if you like this, since Mike Bellamy has given me permission to publish an even longer piece with even better tidbits. History is facinating! The schools should assemble at 9 A.M. in their various rooms. At 9:30 the detail of Veterans is expected to arrive. It is to be met at the entrance of the yard by the Color-Guard of pupils,—escorted with dignity to the building, and presented to the Principal. The Principal then gives the signal, and the several teachers conduct their students to the yard, to beat of drum or other music, and arrange them in a hollow square about the flag, the Veterans and Color-Guard taking places by the flag itself. The Master of Ceremonies then gives the command “Attention!” and begins the exercises by reading the Proclamation. When first to thy strand Hope pointed the way. That led where the Mayflower of Liberty came. Dear Country, the star of the valiant and free! Thy exiles afar are dreaming of thee. No air breathes such incense, such music as thine. Give welcome and room to strangers oppress’d. Find life in thy freedom and joy in thy song. And manhood is mighty where manhood is free. O Union of States, and union of souls! That rises where people and rulers are one. “The Meaning of the Four Centuries” A Declamation of the Special Address prepared for the occasion by The Youth’s Companion. “Columbia’s Banner,” A Reading of the Poem written for the Occasion by Edna Dean Proctor. Here should follow whatever additional Exercises, Patriotic Recitations, Historic Representations, or Chorals may be desired. 8. ADDRESSES BY CITIZENS, and National Songs. Source: The Youth’s Companion, 65 (1892): 446–447. Reprinted in Scot M. Guenter, The American Flag, 1777–1924: Cultural Shifts (Cranbury, N.J.: Fairleigh Dickinson Press, 1990). This entry was posted on dimanche 17 octobre 2010 at 2:15 and is filed under groupes ethniques, histoire, immigration, libertés, relativisme culturel, société. You can follow any responses to this entry through the RSS 2.0 feed. You can leave a response, or trackback from your own site. The Pledge was much more than just an ad to sell magazines; it was also an ad to sell socialism for government schools (socialist schools) and that latter ad continues to run every day. It was written by a national socialist (Francis Bellamy) and was the origin of the nazi salute (of the National Socialist German Workers Party) and inspired similar behavior there and globally. See the work of the historian Dr. Rex Curry (author of « Pledge of Allegiance Secrets »). You mean the Rex Curry who was finally banned from Wikipedia for his notorious rantings? Thank you for not disputing the facts discovered by the historian Dr. Rex Curry. He was not banned from wakipedia. And wakipedia confirms Dr. Curry’s work. But it is clear you are not allowed to post there. And yet you are another dupe of the anonymous bulletin board that tricks people of your ilk because its name rhymes with encyclopedia?